We reported a few months ago the launching of the beautiful MC 23MK IV Sollazzo. 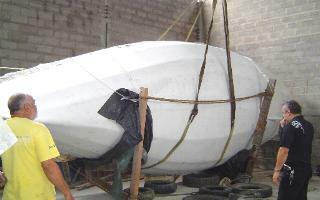 Now, her builder Flavio Traiano sent us an e-mail relating the first cruise aboard his home-built cruising sail boat. We were particularly pleased in receiving this e-mail, considering we developed these plans having in mind young families like his. The fact that he and his family had a great time during the holidays is a reward for our work, since our intention was to provide to the amateur the plans of a cheap and easy to build twenty-three foot sail boat capable of taking a small family in a coastal cruise in comfort and safety. His report about the trip say a lot about how pleased he was with the new experience. His words sound like music and are very gratifying for us. Finally we completed our first cruise with Sollazzo, our home-built MC 23 MK IV. 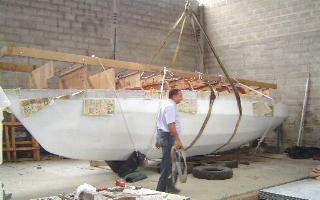 A few months passed after Sollazzo’s launching, but that was the time required to complete the boat, when important details of the interior construction were performed. During this preparation phase we only used the boat in day-sailing, just to test her in the open sea, when we eventually experienced tough weather, giving us the necessary confidence to go further out. We left Rio in the beginning of April 2008. The trip was eventless and we managed to keep five knots speed average along the way, pushed by a light southeast, sometimes with the assistance of our auxiliary. We spent, my two and a half years old daughter, my wife and I, five marvelous days gunkholing between Ilha Grande and Angra. We slept and cooked aboard during all these days, and this included two delicious barbecues grilled in our marine kettle. I was delighted about my crew's enthusiasm with this life-style during these hollidays. Our pocket cruiser accommodated us comfortably during the whole trip. We managed to store neatly our food supply, cooking utensils, diving and fishing equipment, tool kit, sailing hardware, etc, besides an incredible amount of personal gear. It wasn’t even necessary to refill the water and fuel tanks during the cruise, in spite of daily fresh water bathes and plenty of motor-sailing. We used the engine for about one hour daily, enough to ensure full-charged bateries, even though there was no worry about energy saving. We used regularly our stereo and watched films in our notebook, never experiencing lack of power aboard. The photos attached give a good idea on how wonderful our cruise was. The first trial couldn’t be more pleasant. Sollazzo proved to be an excellent boat for her size. There are still other small things to be done, however, from now on I consider to have concluded the construction, and that the boat is ready to go anywhere. This boat is a nice example of successful amateur construction. Our client Flávio Traiano quietly built her, almost unassisted, during the weekends. He went just a couple of times to our office during the whole construction with a small list of questions. Sometimes he sent us photos of his work in attached e-mails which we published in our news. 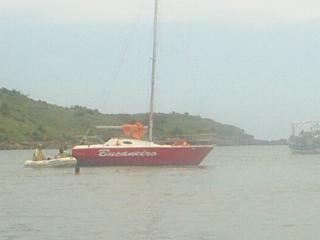 Now his brand new boat is in the water and she is second to none in finishing and quality of construction. Now Flávio can use his boat as he wishes, since the MC23MKIV is one of the rare twenty three footers really capable of sailing offshore. Click on images to enlarge them . 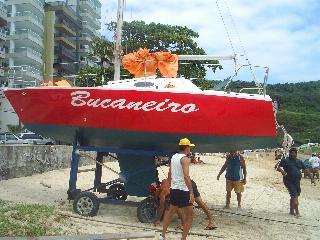 Built by the engineer Paulo Roberto Carneiro in the city of Corumbá, central Brazil, it was launched in Guarapari, eastern Brazil, the Multichine 23 Bucaneiro. To reach its port of registry, the boat had to be transported by truck for more than three thousand kilometres. Now Bucaneiro is already sailing, and for Paulo Robertos enjoyment, he discovered that his new boat is the fastest in that locality. We, at Roberto Barros Yacht Design, congratulate him for the nice job accomplished. 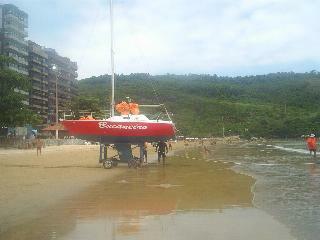 See photo of Bucaneiro being launched at the beach of Guarapari. E-MAIL FROM FLÁVIO TRAIANO, BUILDER OF A MULTICHINE 23. It's with a happy feeling that I send you the photos of my up-turned Multichine 23. Everything went smoothly despite all the tension that preceded the operation. Now, in this new position it's easy to confirm that the internal volume is excellent. For those who come to pay us a visit, I just tell tell them that the boat is twenty five feet long which actually is true. 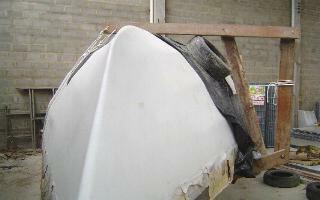 If the optional transom platform is considered, this is its overall length. The volume of the lockers is also impressive. This will be great when we go on extended cruises. Of course, being 6'2" tall I can't stand upright inside the cabin, but I can move around the interior without discomfort. I feel, more than ever, that I have taken the right choice when I chose these plans as the perfect cruising boat for my family. Well, now I am more than ever anxious to conclude the job. Thanks for the nice plans and I wish you all from the office a Happy New Year.